Its name is of Greek origin meaning “scythe” and the long, narrow shape of the town surrounded by the sea has mount Erice at its handle, the elected site of exiled Trojans worshipping the goddess Aphrodite. Its ancient history is closely tied to Africa: the city was founded by Phoenicians, as was Carthage, and it was at the centre of the great naval battles between Carthage and Rome. And still today in the streets of the port there is an African air, in the colours, smells of couscous and the many Tunisian fishing crew to be found there. In the middle ages, the town took on renewed life under the Arabs who created new districts and commerce, new agricultural and fishing techniques that brought the port back to its glory days of old. In 1154, the Arab geographer Edrisi gave a perfect description of Trapani “a city of ancient origins, situated on the sea and surrounded on each side. [...] here fish is in abundance and more than needed; they fish large tuna with great nets and a high-quality coral: and a salt-pan is adjacent to the city’s port”. Its position - between the Tyrrhenean and African Sea, facing the Egadi Isles - has such an evocative fascination to have led the English writer Samuel Butler, who travelled widely in Sicily, that here were the places described in the "Odyssey" and that the poem was the work of a Sicilian woman. Butler’s book “The authoress of the Odyssey”, published in 1897, inspired another English author, Robert Graves, who wrote in 1955 a novel on the same theme, “Homer’s Daughter”. Still today, Trapani’s destiny is tied to its port and the sea: a pivotal moment was its selection for America’s cup regattas in 2005. Restoration and renovation work was commissioned for the event that has brought out the antique beauty that permits very pleasurable sojourns. Flanked by the remains of the ancient walls,the sea-front stretches for kilometres. Because of its strategic position, the city has always been defended by watch-towers and fortresses that in no small way contribute to the charme of the place. The Castello della Colombaia, built during the Punic Wars on a rock 600m. in front of the harbour entrance and attributed to the Carthaginian general Hamilcar Barca is one of Trapani’s symbols. In 1360, Queen Constance of Castile on her way to marry Frederick III of Aragon stayed here. In the 15th c. it was again a fortress and later a prison. Strolling along this ancient water-front it rises like an apparition surrounded by the sea. The extreme point of the city is characterised by the Torre di Ligny, built in 1671, that today houses the prehistory museum. You reach it along a narrow path flanked by an intense blue sea frequented by bathers in the summer months. The fishing harbour is not far. Here we find the ex-lazaret or quarantine station that today houses the Lega Navale clubhouse. It is set upon a small island now linked to the mainland where crews from vessels with suspected epidemic aboard went through quarantine. The new Lazaret was rebuilt in 1830 in the form of a large exhedral. The interesting and lively fish market in Piazza Mercato was once outside the city walls and the present 1874 layout is based on an arched portico and central fountain portraying Venere Anadiomene (Venus arising from the sea). 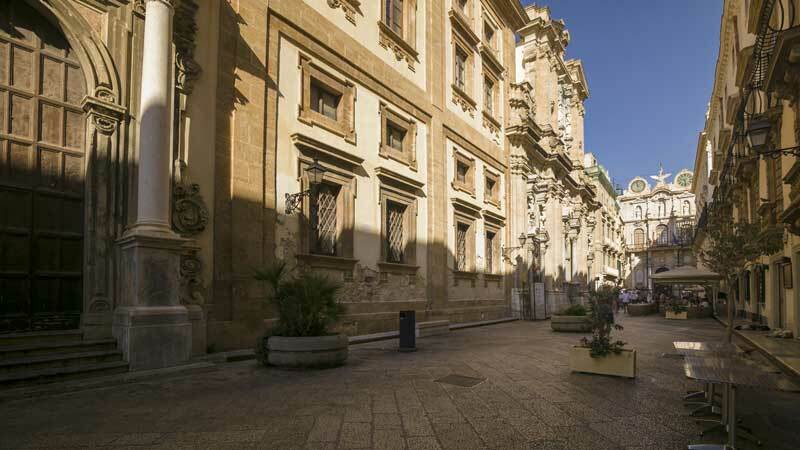 The Pepoli Museum is a must where, amongst other fine artworks are the beautiful coral collections fashioned by local craftsmen using the rich coral deposits that were in Trapani’s seas. There is also an elegant area in the town - corso Vittorio Emanuele, via Torrearsa, via Garibaldi, via Fardella - where it is pleasant to shop or stroll in the evening for some people watching, while for over 50 years a quality summer opera season has been held in the open-air theatre in Villa Margerita in July. Trapani’s top attraction of the year, both from the spectacular and religious point of view, is Good Friday: for more than 400 years the traditional procession of the “Mysteries” has been held in which 20 sculptural works showing the Passion and Crucifixion of Christ, decorated with precious silver and flowers, are slowly carried shoulder-high in procession through the town while the bands play. The artworks date to the 17th and 18th centuries and each one expresses the devotion of one the town’s arts and crafts corporations. The appointment for the start of the procession is at the Chiesa del Purgatorio at 2 pm every Good Friday, the ritual ends on Saturday morning. It is an extraordinary experience that merits an Easter visit to the town. 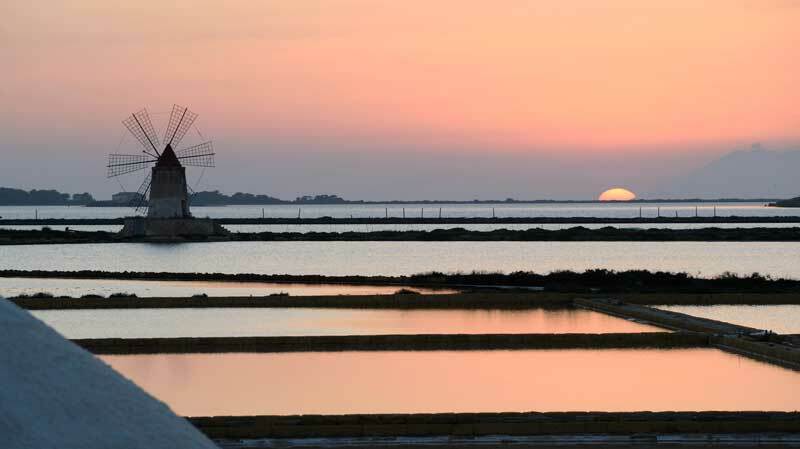 The “Saline di Trapani e Paceco” reserve is just outside Trapani along the road to Marsala. In a seascape of large stretches of water that under the sun create strange geometrical patterns and heaps of white salt and windmills, you can follow a network of paths and observe the various stages of salt production, a tradition that probably goes back as far as the Phoenicians. In remote antiquity, the fame of Trapani’s salt reached all the Mediterranean markets. The reserve also has enormous naturalistic value: it is the last bastion for migratory birds heading for Africa across the Sicilian Channel and a good 208 bird species have been recorded, among which the splendid Greater Flamingo and the Great White Egret.